The Marshall MS4 Micro Stack Electric Guitar Amplifier is the little speaker stack that will blow you away with its punishing 1-watt wail. 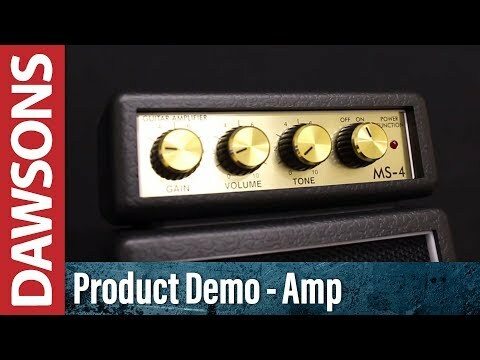 As part of Marshall’s MS Series of amps, you could be forgiven for thinking this is a mere toy, but do not be fooled. The MS-4 produces a sublime range of tones, as one would expect from a company with such a prestigious history as Marshall. The MS-4 Micro Stack looks every bit the part, with a combination of straight speaker cabinet base and angled speaker cabinet above, which is completed by an amp head. The beauty is in the detail, with distinctive black “Marshall” styling on the enclosures and speaker cloth, instantly recognisable white “Marshall” logo on the front of each cabinet, and gold control panel with gold and black dials. Along the front panel you will find a selection of controls, with Master Volume and Master Tone pots handling your level and tone-shaping needs with absolute precision. The MS-4 is equipped with a Gain pot, which controls the pre-amplifier gain to take your signal from clean and bright, to thick and gnarly. Bags of Marshall character spring forth from the dual speaker setup, giving you nothing but sublime, joy-inspiring tones. The MS-4 Mini Stack is the ultimate in portable battery/main operated micro amps, packing the full, legendary Marshall tone into a tiny case measuring in at just 25cm x 11cm x 6cm. The Marshall MS4 Micro Stack is perfect for the busking musician, or just that guy that loves to be the life of the party. The Marshall MS4 provides an incredible sound that is contrary to the small dimensions of the amp, and what's more, is that it gives you the legendary Marshall tone that everyone loves. The Marshall MS4 is also great as a practice or warm up amp for when you attend performances, it's super easy to transport around, and it will even fit into most guitar bags, so there's no extra baggage when you're out on the move! The MS4 also has a headphone output for those who want to rock in private. This output can also be used to effectively drive an external power amp. The MS-4 also features a pull-out stand for upward angled sound projection. Posted on 26/09/2012 by wilko The amp over the first few days was working fine and was a delight to use as the stand fits in your bum pocket nicely but after I turned up the volume and played some intense solos it started to emit a slight burning smell so I bought a larger 30-watt amp. Later on I went back to this amp and I played it for longer to see how bad the problem was and after 30 mins it just burnt up and hasn't worked since. Not even a broken fuse. Posted on 14/06/2012 by Jon When I first played one of these I thought they were great fun whether your having a sing a long with friends or trying to shred on the go. Great piece of kit! Posted on 31/05/2012 by Mike I bought this so I wouldn't have to cart my amp downstairs all the time, but when my amp broke I was dependant on it for 3 weeks and to be honest it did the job brilliantly! It sounded great for its size and price and handled all my pedals pretty well. It sounds much better plugged in than with the 9V battery. I would definitely fork out the extra £5 for rather than the Marshall MS-2 because it's bigger, has the vital gain control and just looks so much better.